To make the cupcakes, beat together the butter and sugar until light and fluffy. Stir in the sieved flour. Divide the mix into 3 bowls, then add a different colour to each bowl. Spoon in cupcake cases and bake at 170°C for 20 minutes, then allow to cool. To make the mermaid tails, add a cup of each of the coloured candy melts to a separate microwave-proof bowl. Microwave on 50% power for 3-4 minutes, stirring every 30 seconds until melted. Carefully pour each colour into a separate piping bag. Fill the mermaid tail mould with the melted candy melts. Stretch out the mould and carefully pat it on the counter to ensure every little crevice is coated. To remove, carefully stretch out the moulds and ease out the cooled tails. Make the meringue buttercream and divide the mix into 2. Colour one green and the other blue. Pipe a swirl of blue buttercream, then pipe the green layer on top. 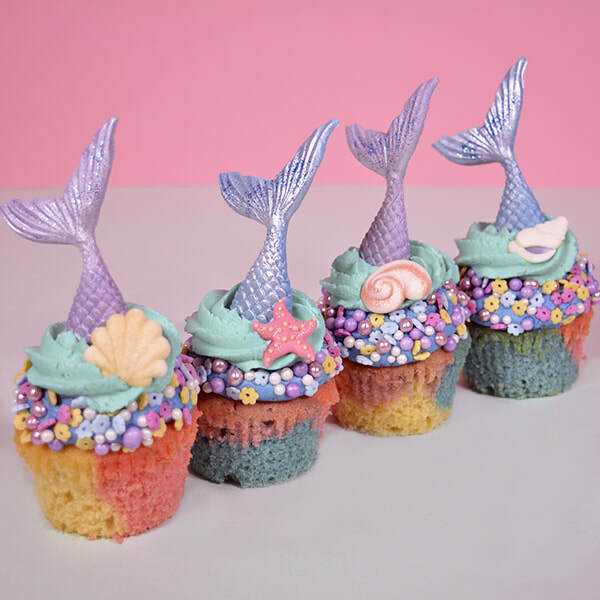 Press a mermaid tail into each cupcake, fins facing upwards. Decorate with Cake Angels Blush sprinkles and finish with Cake Angels Aloha! decorations.